Here’s an example of what was surely one of the most enduring satirical images produced during the eighteenth century. 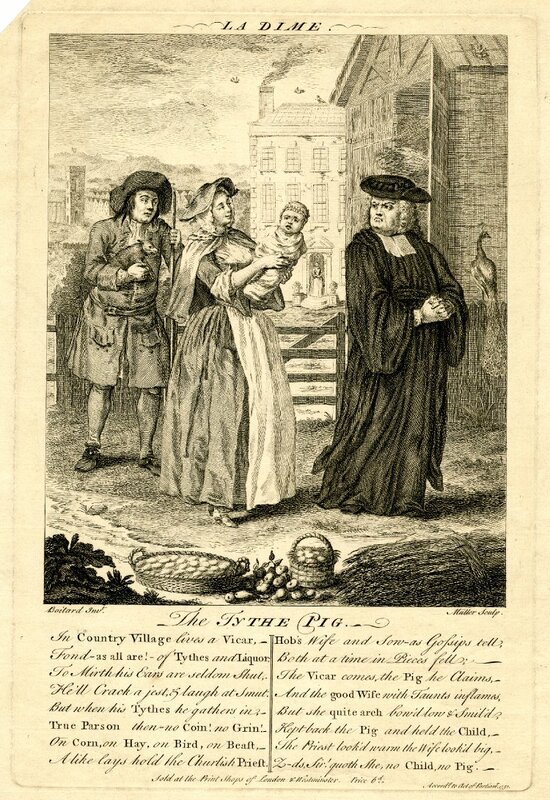 The original Tythe Pig design was produced in London by Louis Philippe Boitard and Johann Sebastian Müller in 1751 and was copied by a range of publishers including Carington Bowles, Robert Sayers and S.W. Fores among others. 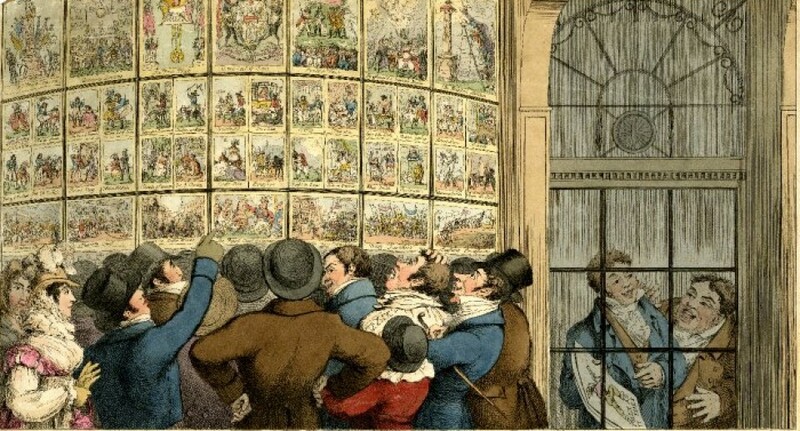 Indeed, it’s popularity was such that variations of the design were still appearing on ‘scrap sheets’ of caricatures during the early 1830s. 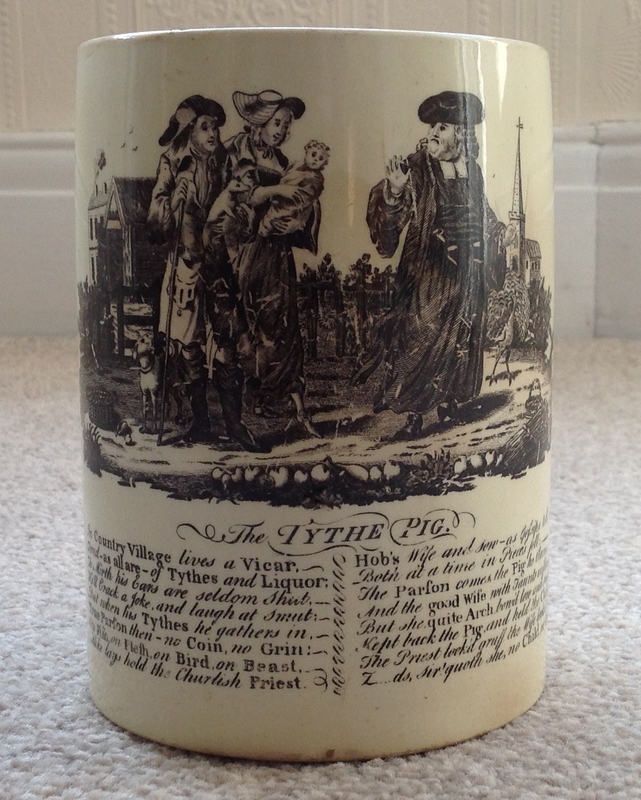 It was also one of the first satirical images to be adapted for use on printed pottery, with a set of delftware tiles produced by John Sadler of Liverpool around 1758 being the earliest known example of the image to appear on ceramics. It was then picked up by Josiah Wedgwood and a host of lesser potters for use in other forms of transfer printing and as the basis for a number of sets of porcelain figurines. The creamware tankard shown here was probably produced in Liverpool sometime during the early 1760s by Sadler or one of his imitators. The design refers to a system of ecclesiastical taxation known as tithing that had existed in England since the Dark Ages and which required all those involved in agriculture to hand over a tenth of their annual yield to the local church. As goods were typically accepted in lieu of cash, it was not unusual to see local vicars trooping about their parish on tithe day in order to size up the quantities of crops and livestock they could expect to receive from their parishioners. By the mid-eighteenth century this system was seen as an anachronistic annoyance at best and an outright affront to personal liberty at worst. It was particularly unpopular among Catholics and the burgeoning numbers of Protestant dissenters, who were still required by law to cough up a tenth of their income in order to pay for the upkeep on an Anglican priest who they had absolutely no use for. Ultimately the system was deemed to be so provocative in Ireland, where Anglicans never accounted for more than a fraction of the total population, that it was significantly overhauled by the Tithe Commutation Act of 1836. For the eighteenth century caricaturist the image of the priest turned taxman was probably too delightful to resist, playing as it did into an established cultural narrative in popular satire that delighted in exposing examples of clerical hypocrisy and cant. Nonetheless, this is an image which stops short of actually being offensive to the clergy and part of its commercial success was no doubt based on the fact that it managed to carefully tread the fine line between humour and respectability. For all his apparent greed, the priest is still portrayed as a respectable member of polite society and as the rhyme that accompanies the image makes clear, is in all other respects a rather affable fellow. It is therefore notable that this image appears to have been reproduced far more frequently than more virulently anti-clerical satires of the same period, such as Tythe in Kind; or the Sow’s Revenge and The Vicar and Moses.